The Tale of Kilsa & the Vikings's comes to us from the collected stories of the MacThoy in the tome Gesta Mochthos. This was complied by Hell Louise Van Gelt after her voyage to the Isle of Lude to review the texts kept there at the Abbey of Lost Wages. The story is from the life an Kilsa the Off-Key, a MacThoy Widow living at the time of William the Conqueror. One of her adventures-- which is also corroborated by the Hystorica Calamitatum-- tells of her thwarting a Viking invasion. A section from an Illuminated manuscript created at the Abbey of Lost Wages. It depicts Kilsa's encounter with the Vikings. 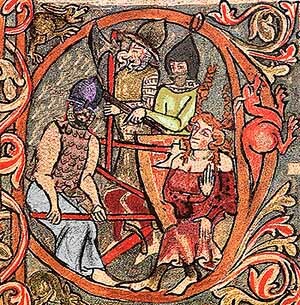 The Vikings, hungry for revenge on the MacThoy who had made a fool out of them, tracked down Kilsa and her band. They caught her on the way to the loo and challenged her to another contest with a wager of double of nothing. Kilsa was sagacious enough to realize that they hadn't had time to restock their ship and refused the bet. They persisted, wagering half their armor on a dice game. They should have known better than to trust Kilsa's die. She won their armor, and went to the loo, leaving the invaders stewing in their juices. The tale proceeds in this fashion with the Vikings stopping and challenging her each night and Kilsa outwitting them with another game of chance. At the conclusion of the fourth evening of gaming, several of the invading hosts most valuable warriors have become Kilsa's personal cabana boys. In the mean time, word had spread that the MacThoy were in the area. Several of the local Eorls & Thanes took it upon themselves to drive the menace off. This task was usually pretty simply as the MacThoy were never looking for trouble, so the lairds only took a small group of soldiers and set off to find them. The leader of the Viking host had had enough of the youth continually tricking them. He and his remaining most trusted warriors schemed at length for a trap they could set for her. On the fifth night they sought out Kilsa, on her usual journey to the privy--which she was beginning to find annoying. The Viking chief proposed one final contest to which the young lass heartily agreed. The leader pointed to the many corks that her family left strewn on the ground and offered to pick a light colored one and a dark one. If she picked the light one, she would get the remainder of their possessions and they would never molest her or hers again. If she picked the dark one, they get everything back and she comes with them. Desperate for the loo, she agreed. The leader collected the corks and Kilsa glimpsed him selecting two dark ones. Knowing the fix was in, Kilsa searched for an escape. The corks were placed into a sack and she was commanded to choose. Kilsa dropped her hand in the bag and pulled forth a cork. Before she opened her hand, a cry went up. It was the thanes coming to run the MacThoy off. They were much surprised to find a Viking host instead. In the confusion, Kilsa dropped the cork. Several of the Vikings claimed they saw it fall and what color it was. Kilsa will have none of it. She told the warriors the easiest way to settle it is to remove the remaining cork. Obviously the one she dropped was the other color. The Thanes are upon them then. Kilsa ducks off for the loo leaving the Vikings screaming invectives delighted to find something to work their frustration out on. And true to their word, this Viking crew left the MacThoy alone.